When my husband and I arrived in Spain our fifth full day there was supposed to be a light day with very few things planned. I had even hoped that I might get a chance to go to a café and write for a couple of hours. However, that plan quickly went out the window before we even arrived at our hotel on our first night. 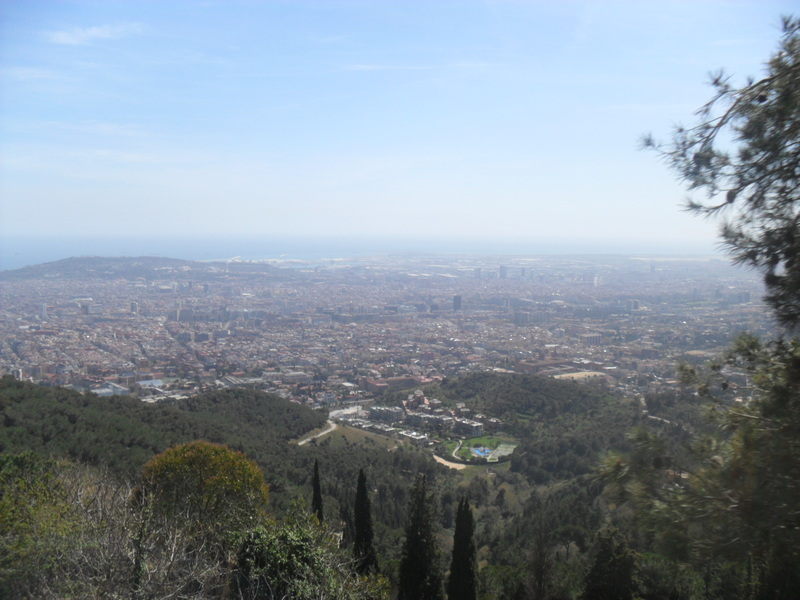 As we were in our taxing going from the airport to our hotel I saw the church on the mountain of Tibidabo and instantly wanted to go there. I had been a little lukewarm on visiting that part of the city beforehand but as soon as I saw it in person I wanted to go. So with that we had our first activity of day six planned. 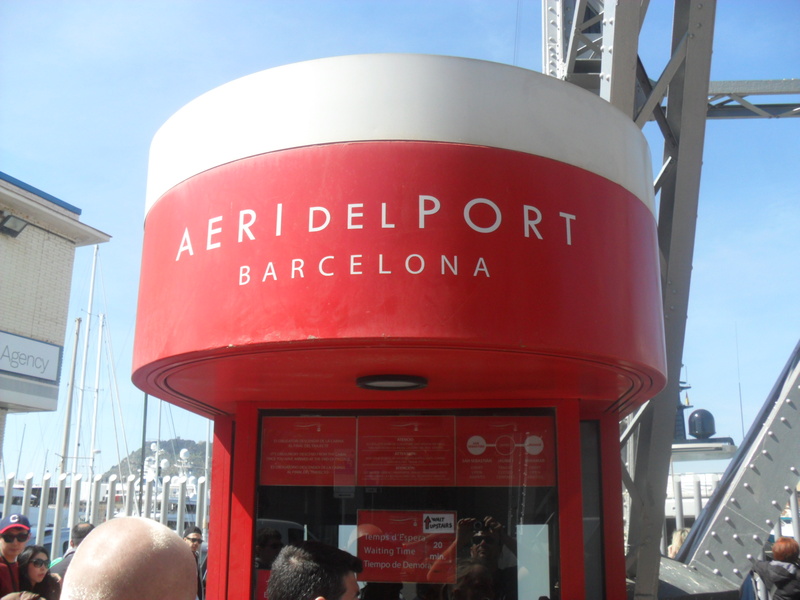 Then on our second day we were not able to ride the cable cars across the Barcelona harbor so that also got added to our sixth day as well. By the time our sixth day arrived what had once been a day free of scheduled activities was now jam packed with four different destinations spread across different parts of the city. To take on such a busy day we needed to have lots of energy. Thank goodness for the fantastic breakfast buffet at our hotel. 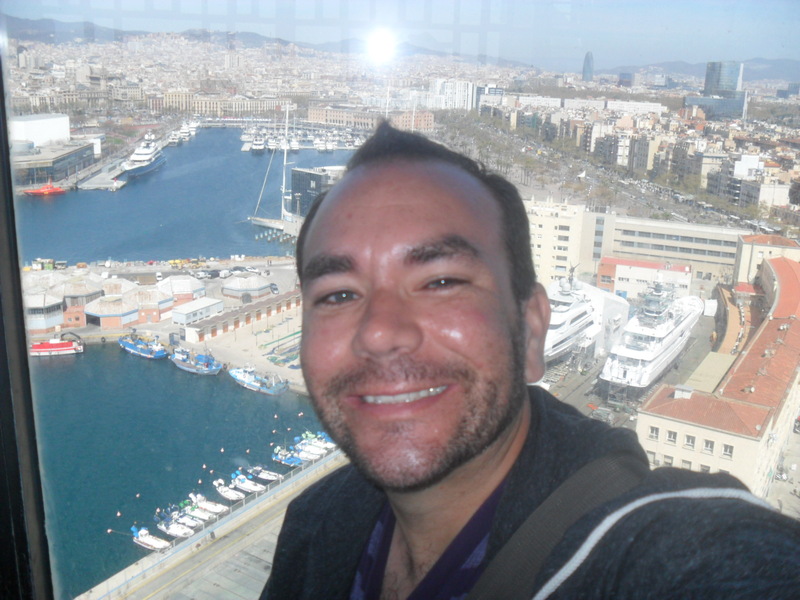 Our first scheduled activity of day six, other than breakfast and showering, was a return to Barceloneta and finally riding the cable cars across the Barcelona harbor. This was something I really wanted to do so I had been very disappointed on day two of our trip when we just missed the cut off time to ride them in the late afternoon/early evening. This time we put the cable cars at the start of the day to make sure we didn’t run into the same issue. The wait to ride the cable cars was about an hour. We have encountered some truly horrible lines in our past travels to Europe, the line to go up to the top of Notre Dame in Paris was by far the worst. 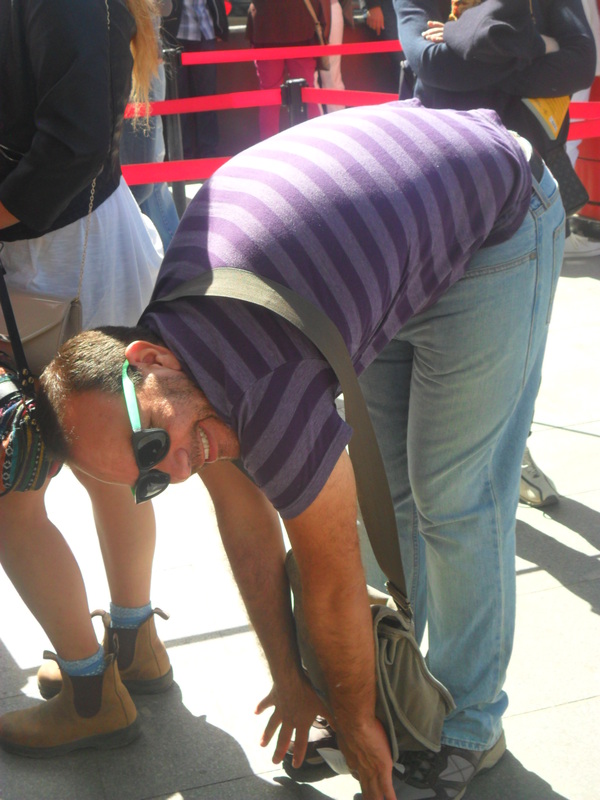 Luckily, this was the first time on this trip we had to deal with a bad line. Thankfully it was also the only bad line we would have the entire trip. Looking back it really wasn’t that bad but between my bad back and my husband’s bad feet the wait in the line certainly wasn’t a comfortable one. 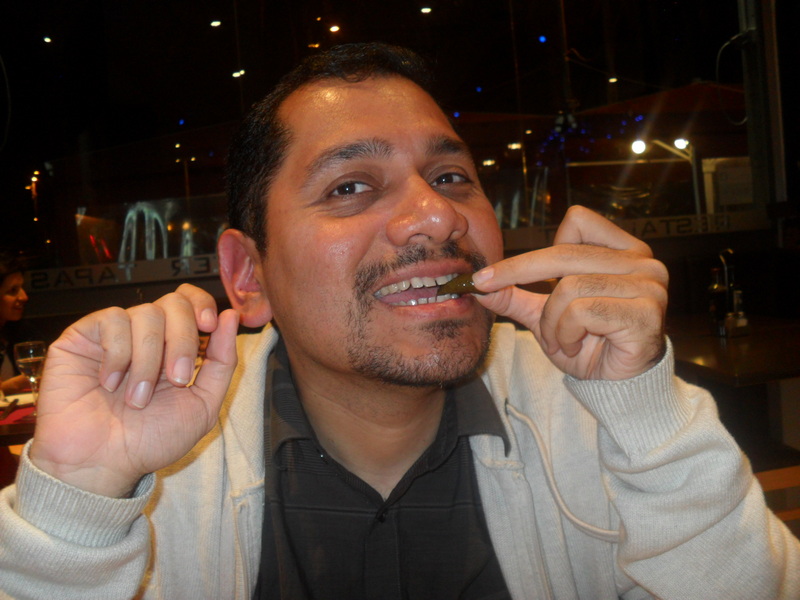 Still, when we finally got on the cable car I was very excited. The views from the cable car were truly fantastic. I am glad we didn’t leave the activity off our list. I would have really regretted it if we had. When we exited the cable car we were, naturally, on the other side of the harbor from where we started. 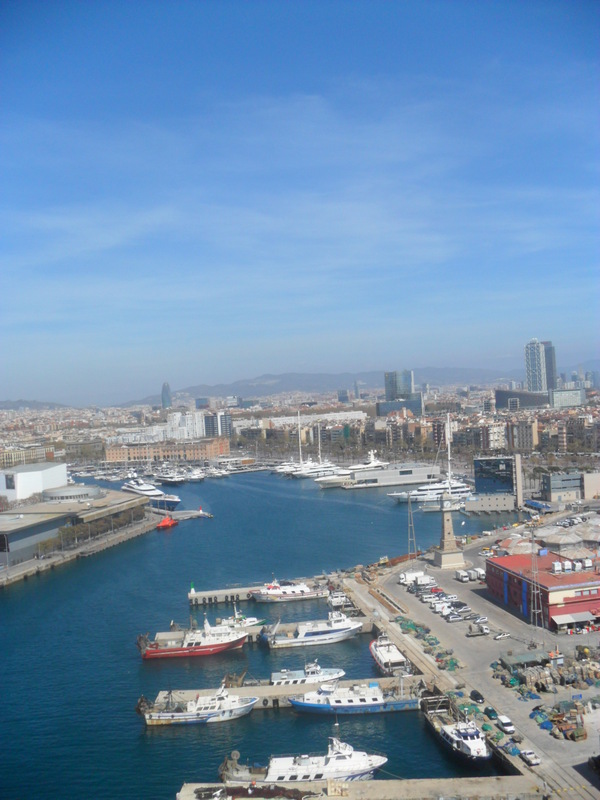 While one end of the cable car is in Barceloneta the other end is on a hill called Montjuic. 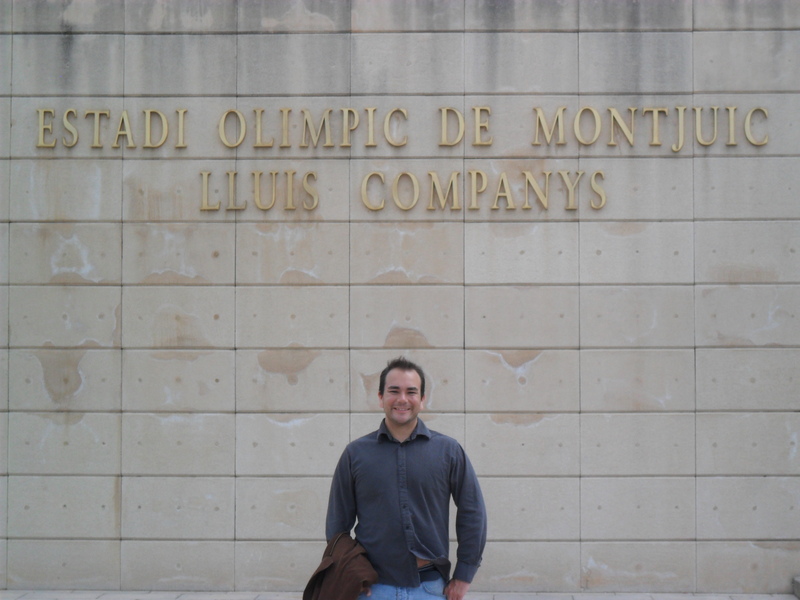 We visited Montjuic in 2011 and saw several of the venues from the 1992 summer Olympics. 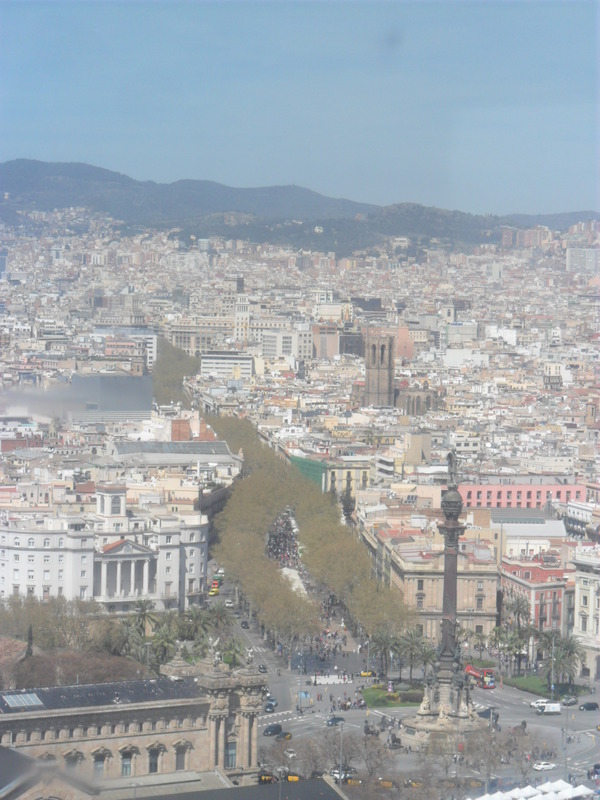 This time Montjuic was just a transition point for us to go from the cable cars down to the metro. 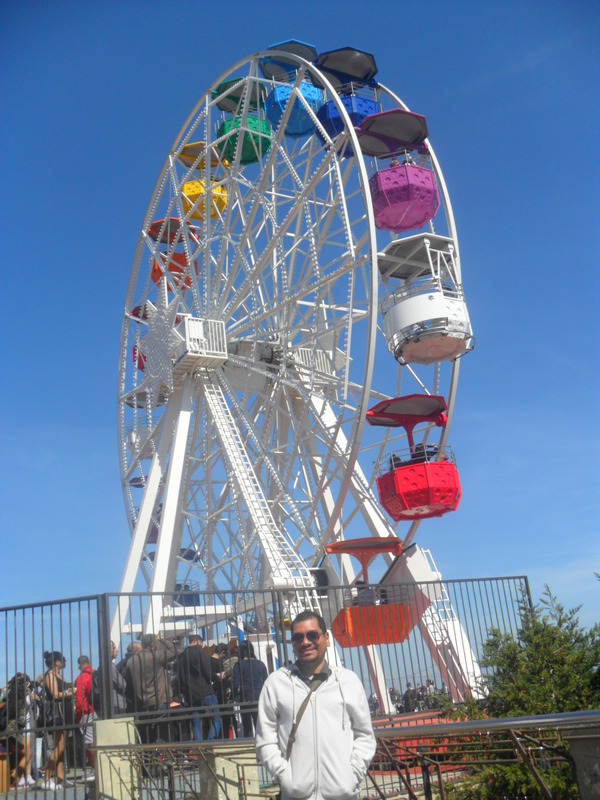 Our next destination was Tibidabo, which is so far out of the city that it involved four different transportations systems. 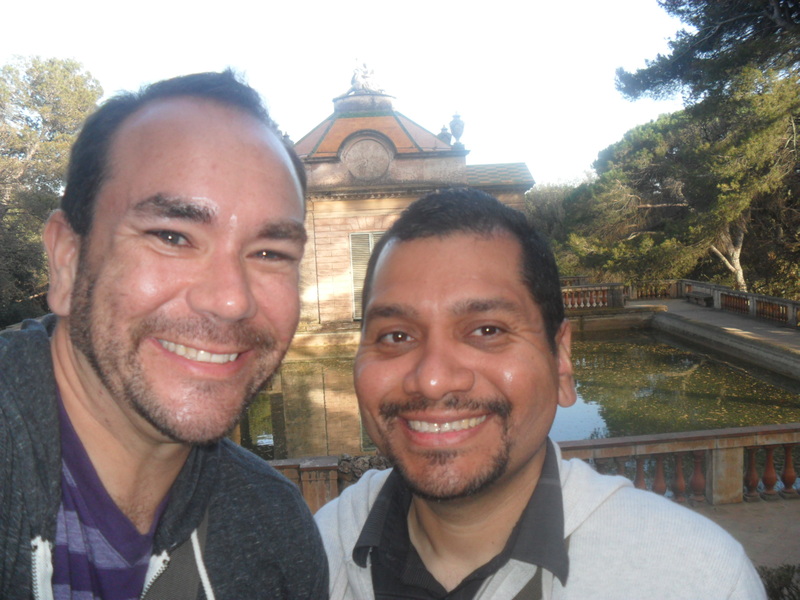 After climbing down the hill from Montjuic we got on the metro and took it to another station where we transferred. However, it was no ordinary transfer. 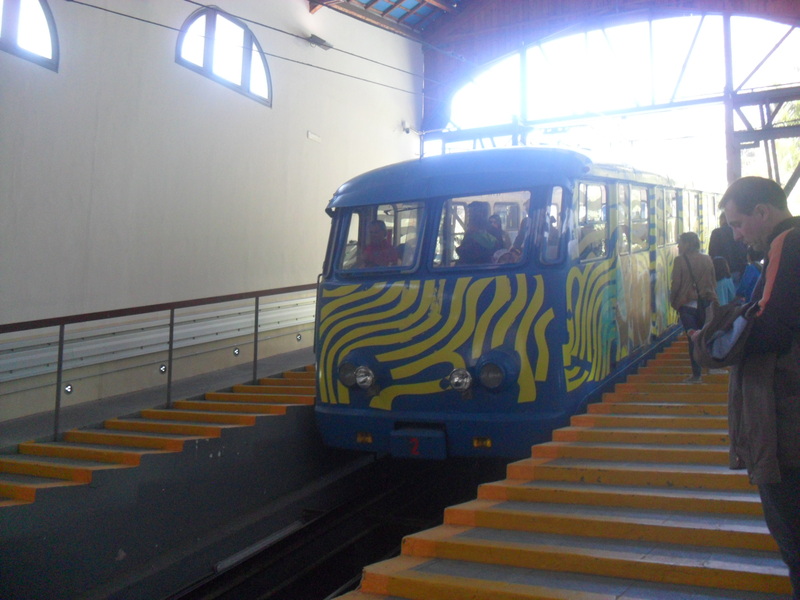 The train that would take us up to the base of Tibidabo was a separate metro system so it required another ticket, whereas a normal transfer didn’t require a separate ticket. 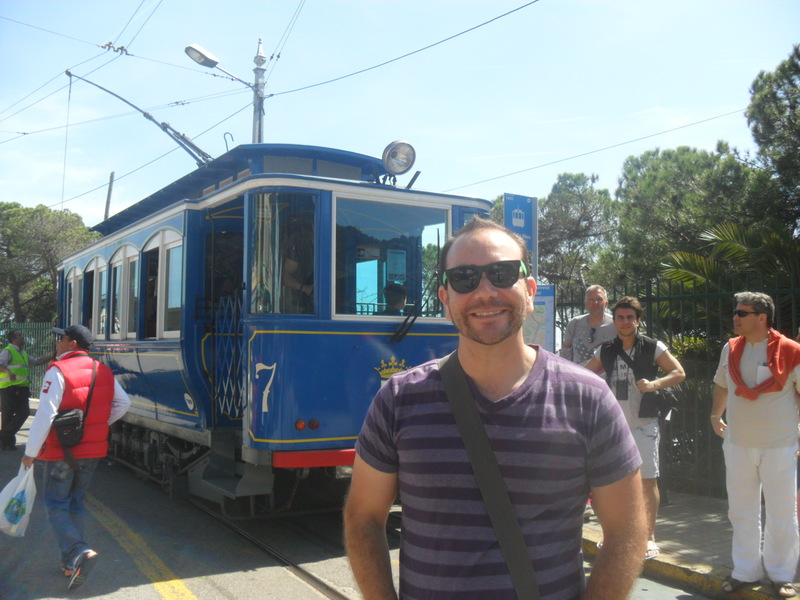 The train that took us up to the base of Tibidabo was nicer than the normal metro trains. 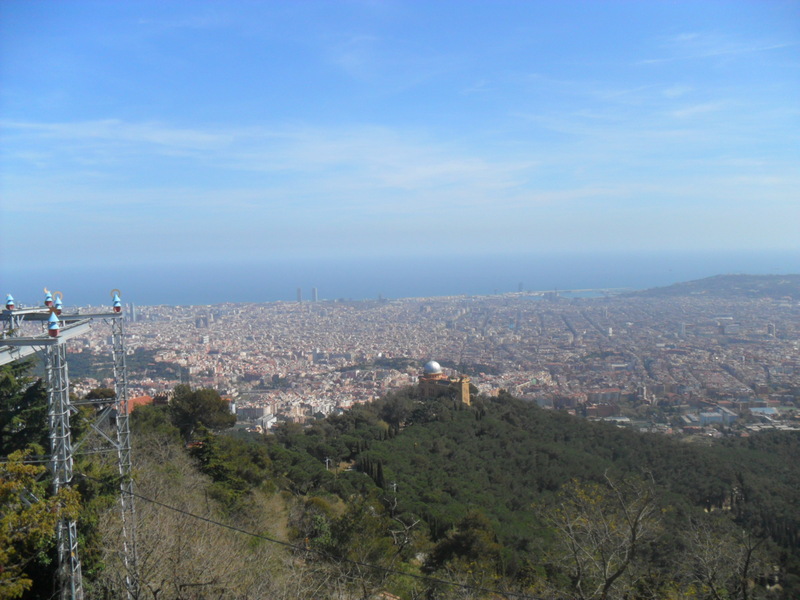 When we emerged from the metro at the base of Tibidabo we were suddenly above the city, but we still had a lot further to climb. We next transferred to a blue street car which required its own ticket completely separate from the regular metro tickets. The ride up the hill on the blue car was quite beautiful. We got off the blue car we had one last transfer to make. This time it was to a tram that would take us up the final bit to the top of the mountain. 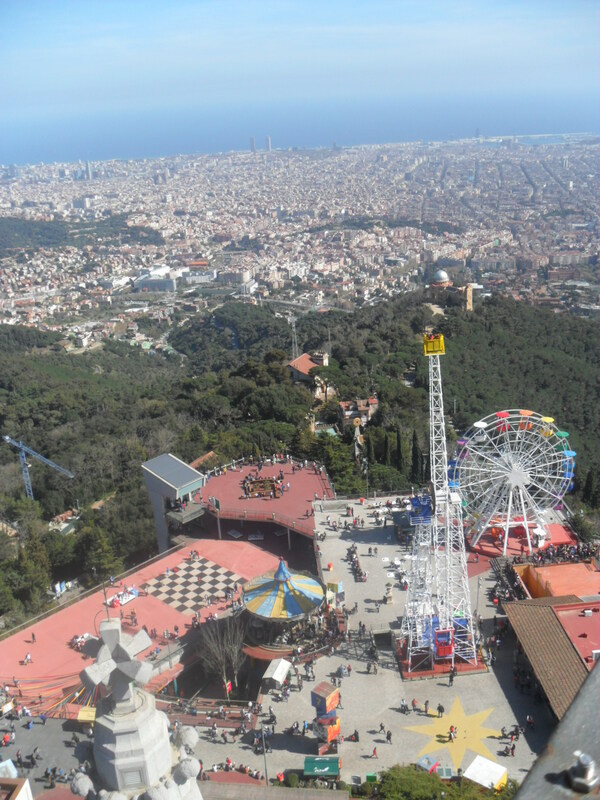 When we got to the top of Tibidabo I was taken by three things. One, how beautiful the view was from the highest point above the city. We could see all of the way to the ocean (where we had just been). Two, I thought it was absurd that there is an amusement park right next to a church. Three, how much I wanted to ride some of the rides despite the fact we didn’t have time. After taking a little break and enjoying our snack bars we headed into the church. 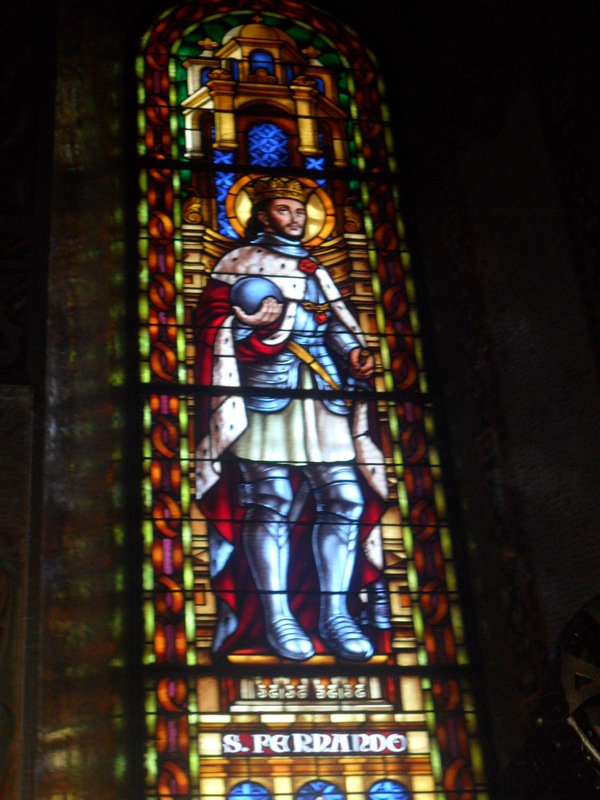 It was another nice, peaceful catholic church. 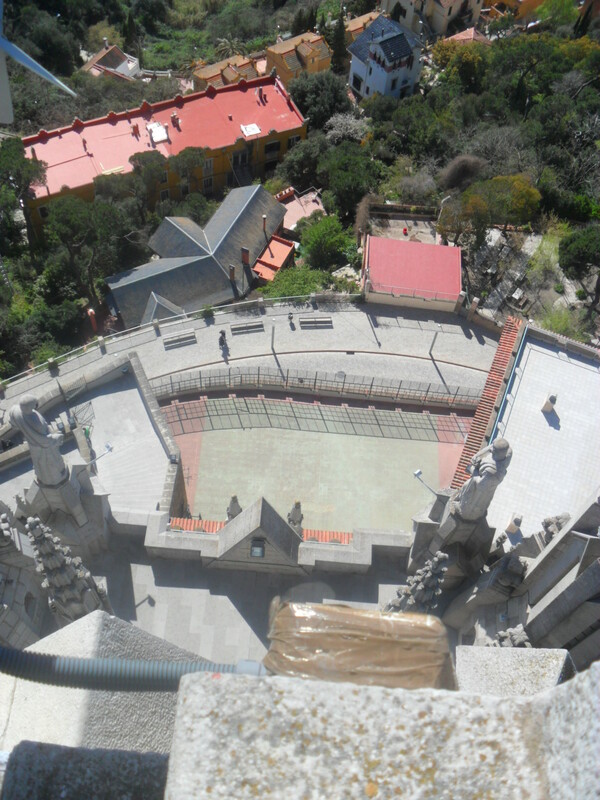 We then took the elevator up to check out the view from above the church. It was a magnificent view but the height got to my husband a little bit. What I liked most about the view from the top of the church was that I could see parts of the amusement park I couldn’t see before. I made me really wish we had time to ride the rides. But we didn’t, so we descended from the church. The exit from the top of the church dropped us in another part of the church. We spent a few minutes checking out the new part of the church before exiting altogether. After picking up a few souvenirs it was time to head back down the mountain. The decent included the reverse rides on the trolley and the blue street car. However, we did not get back on the same metro line. To get to our next destination on the train only would have required us to backtrack all the way into central Barcelona only to transfer and end up not far from where we were. Thankfully, my husband had studied the maps and realized that if we only walked about a half mile east we could catch the metro line we wanted without going back into the center of the city. This move may have required a little more walking but it saved us at least an hour. What was interesting about our walk was that we were one hundred percent out of the tourist area. 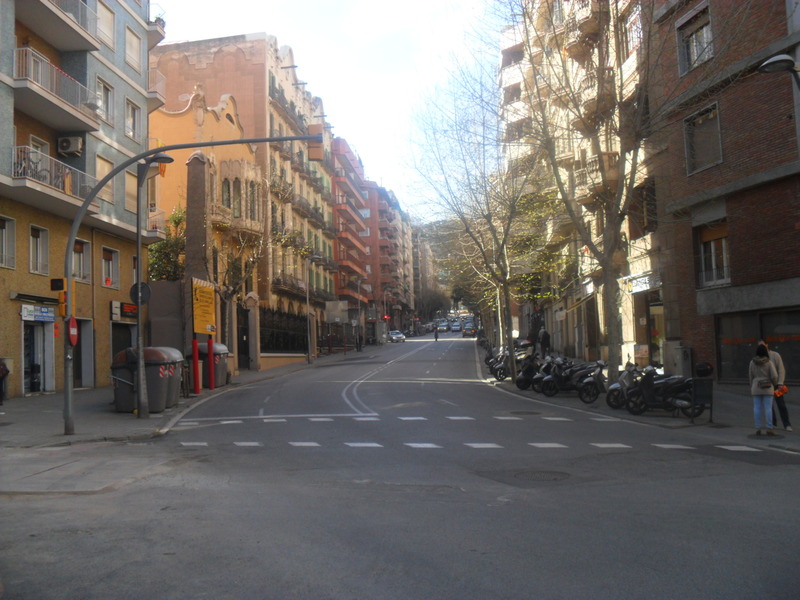 We truly were just in an area of Barcelona where people live. I don’t know that the neighborhood was my cup of tea but it was cool to see. After our short walk we were back on the metro an on our way to our next destination. My husband is great at finding things that aren’t necessarily in the travels books when we go on vacation. 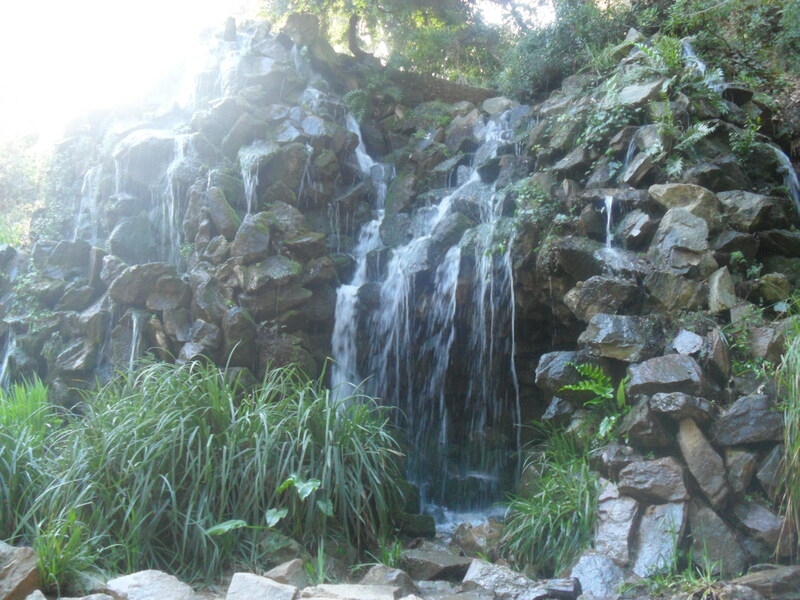 One of the attractions he found for us in his research was a park called Parc del Coberint d’Horta. 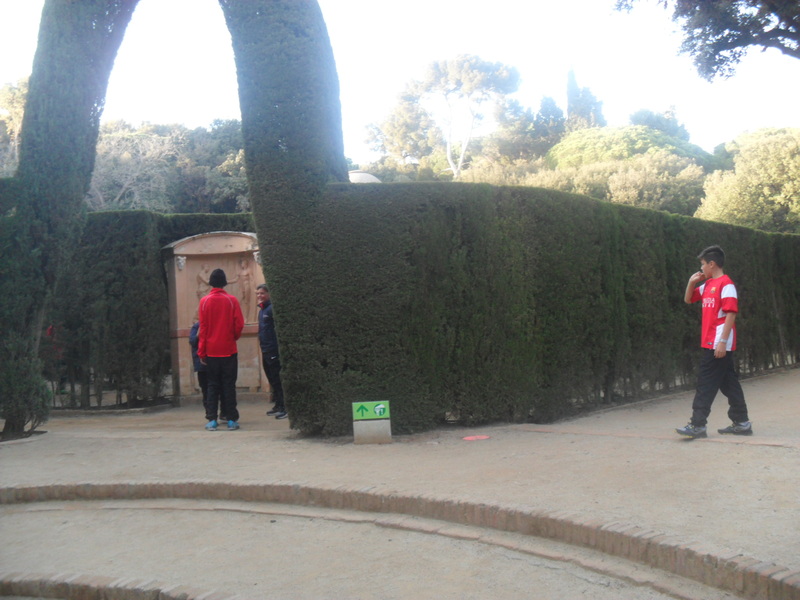 The biggest draw of this park was that it has a very large hedge maze. We were both very excited to check the maze out. 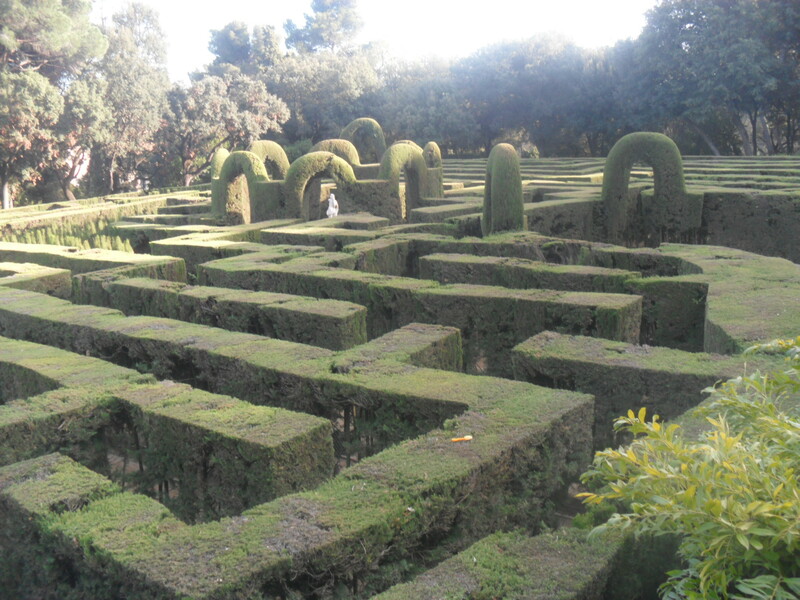 When we arrived at the park we weren’t exactly sure where the hedge maze was so we explored a little bit. We enjoyed seeing areas of the park other than the hedge maze. However, our delay in getting to the hedge maze would come back to bite us. When we finally reached the hedge maze our experience was ruined by a large group of about fifteen to twenty middle school boys who were running amuck. They were loud and obnoxious. Actually, I wish they had only been loud and obnoxious. They also ruined the maze for everybody by yelling out every time they reached a dead end. Not to mention the fact that they were too lazy to maneuver the maze properly. Whenever they felt like it they would just push through the hedges. It was a nightmare. No matter where we were the awful little boys were there. I’m glad we got to see the hedge maze but we both left the park we were both very disappointed in our hedge maze experience simply because of those awful little creatures. Still, we weren’t done yet. 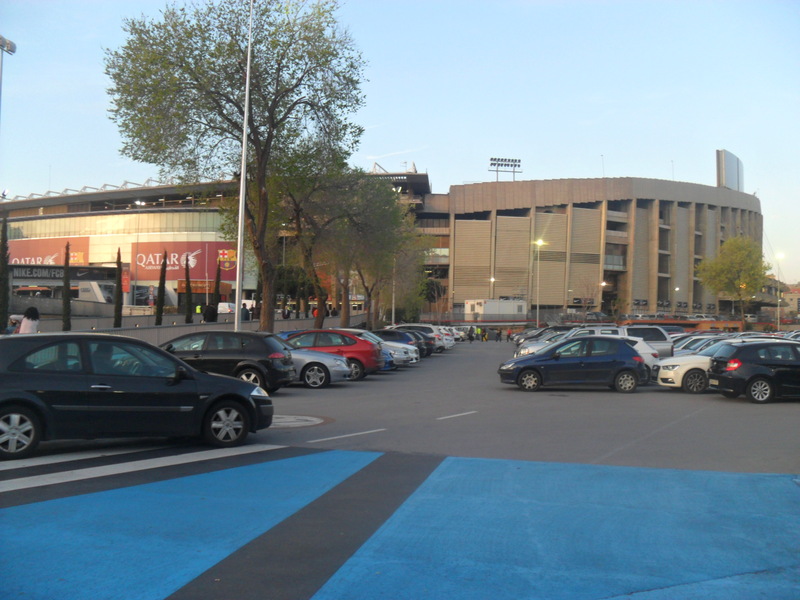 We had one final destination and that was the stadium for FC Barcelona. So once again it was back on the metro to cross to the other end of the city. Like many stadiums the home of one of the most famous football teams on the world is not in the best neighborhood. You could tell that many of the streets near the stadium were very sketchy later at night. Luckily we weren’t there that late. However, we were just a little too late to be able to get a tour of the stadium. We were able to sneak a peak of the field through the doors. 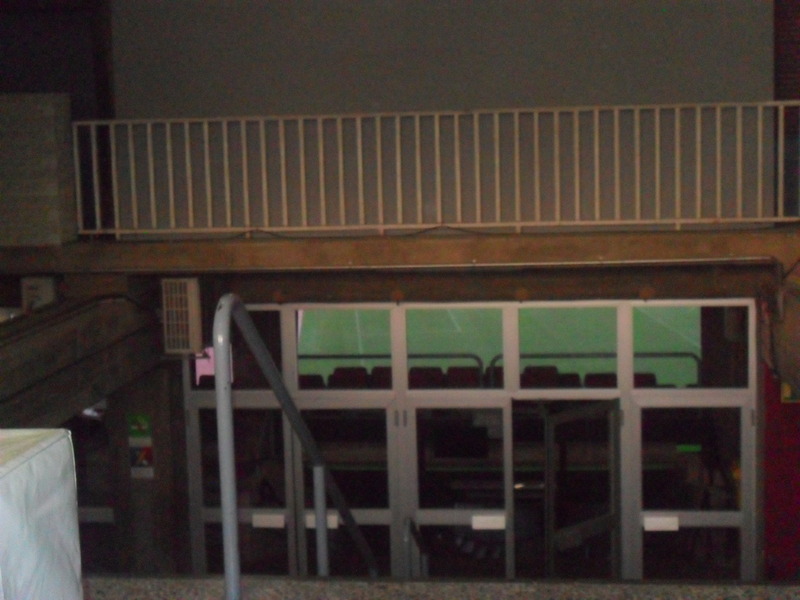 As we made our way around the grounds we found that there was a sporting event going on there but it wasn’t football. It was basketball. We also found out FC Barcelona also has a handball team that plays at the venue as well. Before heading back to our hotel we visited their giant store. 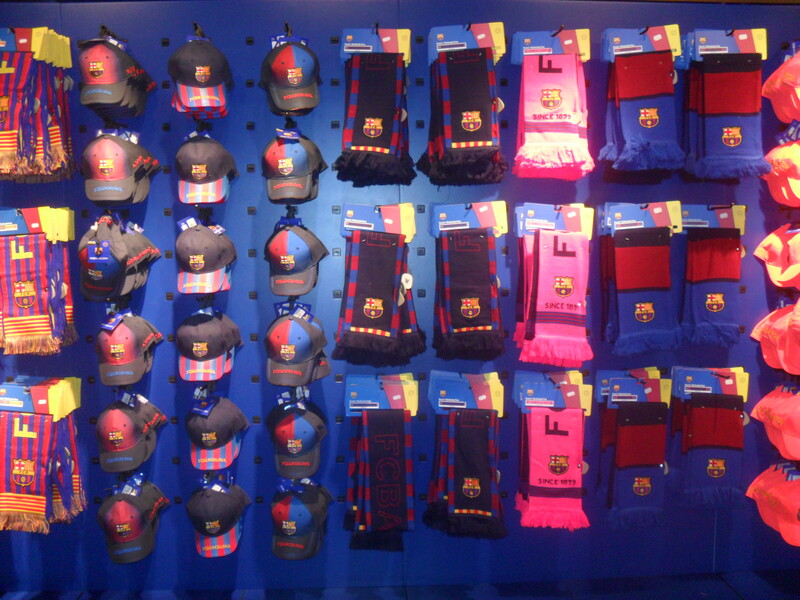 We had already purchased or FC Barcelona souvenirs three days before so there was no need to buy anything there. When our day had begun what had once been an activity free day had four different things planed in very despite areas of the city. Somehow we managed to visit all four of them. We felt very accomplished and headed back to our hotel. After relaxing briefly at our hotel we returned for our third, but not final, meal at the restaurant where we had lunch on our second day and dinner the night before. By now the wait staff remembered us and were happy to have us back. We were becoming regulars!